I totally knew we would love Lisbon. Indeed, the Portuguese capital delivered, and then some. The city, which happens to be one of the oldest in Europe, is highly picturesque, full of incredible history and has both a distinctly local and cosmopolitan vibe. There are fantastic pastries and incredible food and wine. So many cool things to do and see. The people are super nice. And, OMG… fado! I now understand why this city is such a hot travel destination at the moment. A tour in a tuk-tuk was such a unique and fun way to kick-off our visit. Tuk-tuks are not necessarily an “original Lisbon thing” and most associate them with Asia or Africa. But as tourism exploded in Lisbon over the last two decades, they quickly gained popularity here too. The reason is simple: they are a great way to navigate the steep, curvy and often narrow streets of Lisbon and its fast-moving traffic. You can hire them as you would a taxi, to take you from point A to point B, but there are also many companies who offer tours. Go for the latter, you will love it. Our Old Town Lisbon tour with Eco Tuk Tours was so much fun! Our driver and tour guide Nani took us to the Graça, Mouraria and Alfama districts and shared a ton of interesting things about Lisbon along the way. We particularly enjoyed a stop at the miradouro (outlook point) Nossa Senhora do Monte, which offers spectacular views of the city and a short walking tour through the back streets of Alfama, Lisbon’s oldest neighborhood. It’s not every day you get to tour a city in a tuk-tuk. 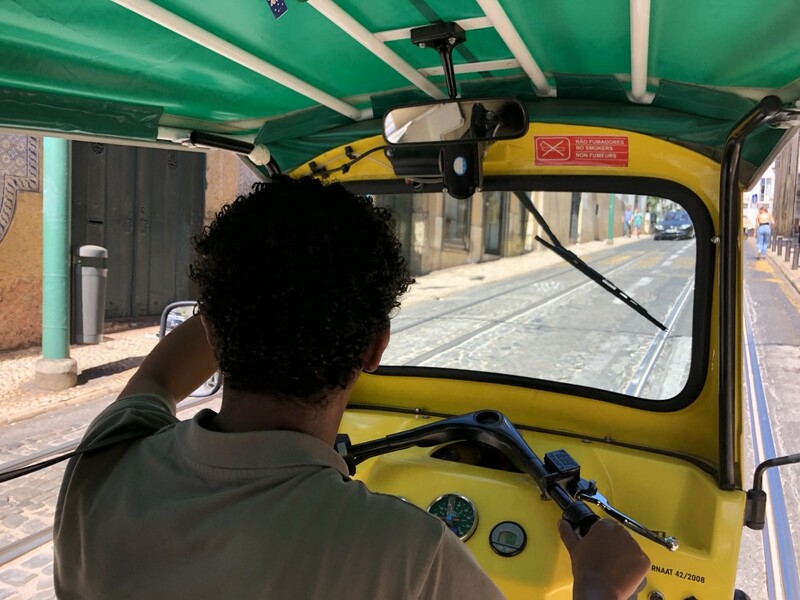 Zipping around Old Town Lisbon with Eco Tuk Tours was so much fun and our guide Nani was full of cool tidbits about the city. The tuk-tuk tour was a great introduction to the city and the perfect thing to do on our first day as we fought through our jet-lag, tired and groggy from our overnight flight from the U.S. This is another great thing to do at the beginning of your visit to Lisbon. Lisboa Story Center is a unique interactive museum, which takes visitors on a 60-minute journey through the city’s history, all the way from the beginning to modern times. It is excellent and not to be missed! The audio guide uses films, photos, models and narration to go over Lisbon’s most important historical events. Our favorite parts were the New World discoveries and the reenactment of Lisbon’s big earthquake and tsunami which caused profound devastation to the Portuguese capital in 1755. 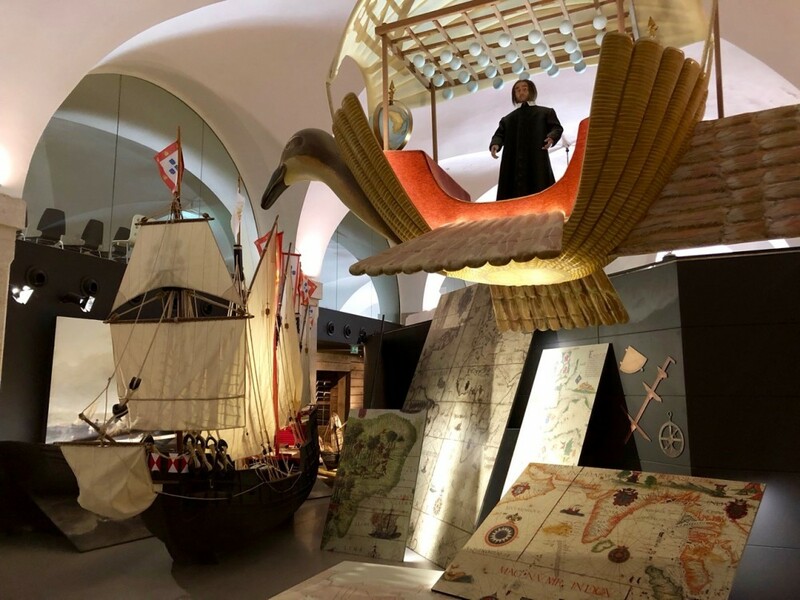 Even for those who are usually not into museums, the Lisboa Story Center is a great way to learn history of Lisbon and Portual in a fun and memorable way. Smart Traveler Tip: For those who love peculiar experiences, right next door to Lisboa Story Center, is a place claiming to be World’s coolest bathroom (or WC, since we are in Europe). Visitors are invited to use the modern facilities and pick their own bright colored toilet paper to use. It made sense after we found out it was designed by Renova, a manufacturer of colorful toilet paper. Not sure about “the sexiest”, but it was fun to check it out and take a selfie next to the colorful paper rolls. The São Jorge castle is one of Lisbon’s most famous landmarks. Despite its name, it is not a “classic” castle, but really more of a fort, located on the top of São Jorge hill, which is the highest hill in Lisbon. Because of this, you will probably be out of breath by the time you reach the entrance, but the spectacular views of the city and its famous suspension bridge will be well worth it. For the best Instagram photos, make sure to climb to the top of the castle walls. 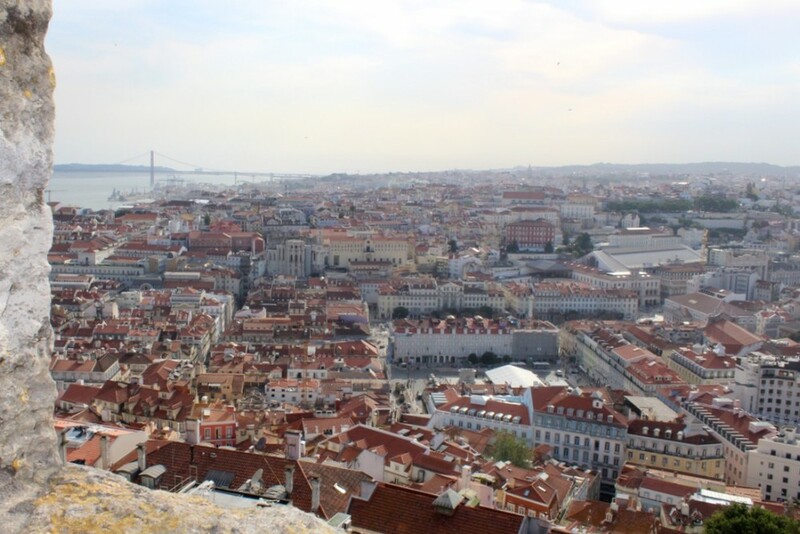 Views of Lisbon from the fort walls of São Jorge castle. The views are not the only impressive thing here though. There is amazing history you can learn by taking one of the guided tours, offered a few times a day. During peak tourist months, there is lots of fun programming with a special nod to families. Another thing Castelo de São Jorge is famous for are its magnificent peacocks who strut their stuff throughout the property while calling out in their signature cries. Just watch out for the ones sitting in the trees…. Alfama is said to be the neighborhood where it all began for Lisbon. This might be in part because it is one of the few areas of the city that survived the devastating earthquake of 1855. The neighborhood is often referred to as the Arab district, because the Moors gave it its distinct look and personality it still radiates today (its name comes from the Arabic word al-hamma, meaning “hot fountains” or “hot baths”). 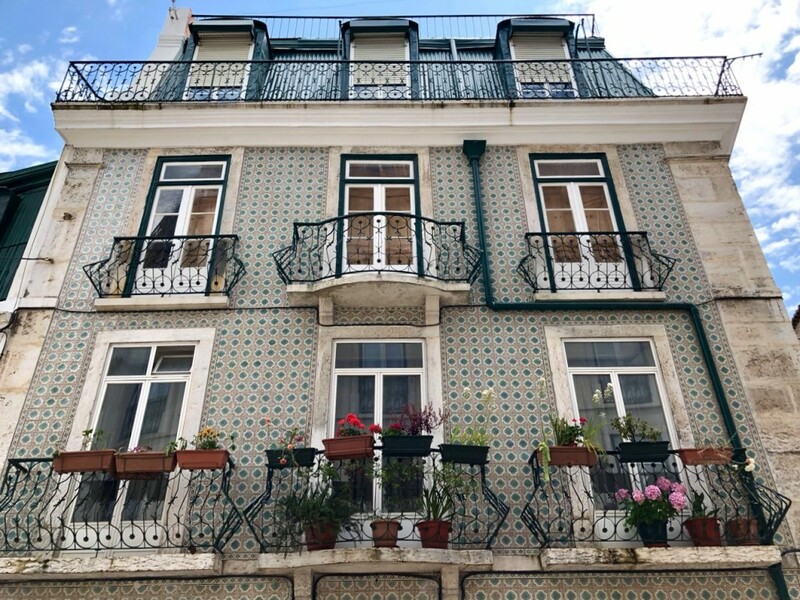 Many buildings in Alfama are covered with azulejos, beautiful patterned tile for which Portugal is famous. We were lucky to be in town during St. Anthony’s festivities, also known as Lisbon’s Sardine Festival, which takes place every June. Alfama is even more special during this time of the year. Like many of the city’s oldest neighborhoods, it looked super festive, decked out in bright and cheerful decorations. Music, parties and, of course, grilled sardines, were everywhere… the atmosphere was incredible! 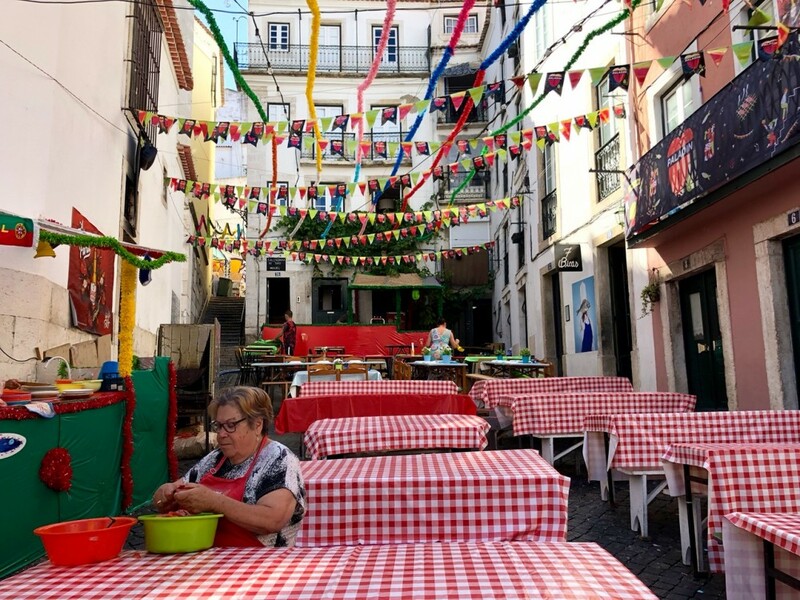 During the Lisbon Sardine Festival every street in Alfama is prepared to celebrate St. Anthony and… party! Jeronimo’s Monastery in Belem is the #1 attraction in Lisbon and for good reason: it is pretty spectacular. The Monastery, which is listed as a UNESCO World Heritage Site, is a great showcase of Manueline style architecture, a distinct Portuguese late Gothic style, known for ornamentation and incorporation of maritime elements celebrating the discoveries brought from the voyages of Vasco da Gama and other Portuguese explorers. Due to its clever design, the monastery miraculously survived Lisbon’s big earthquake with only minor damage. You don’t want to skip this one! Jeronimo’s Monastery in Belem is the #1 attraction in Lisbon and for good reason. 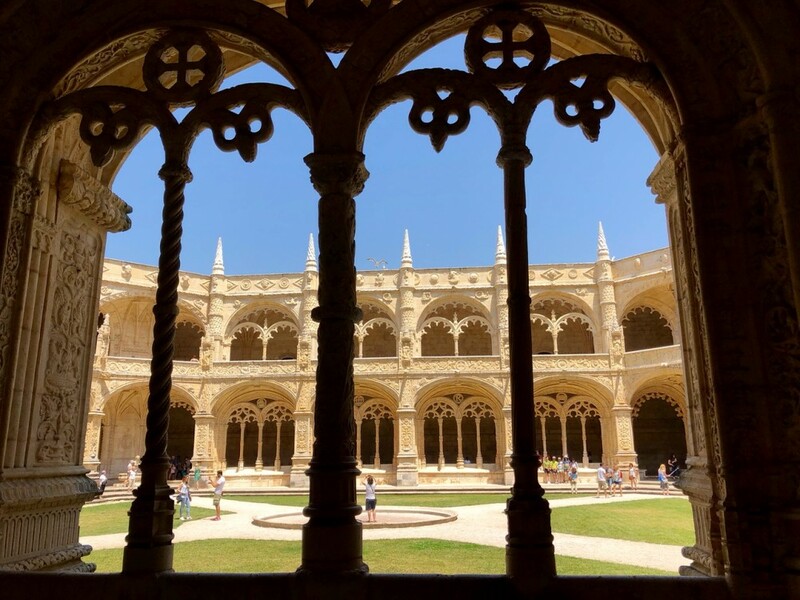 You could spend a day here to take it all in, but the (1) view from the courtyard inside the two-story cloisters, (2) 2nd floor exhibit on the timeline of the Portugese history overlaid with the world history and (3) the stunning church with the tomb of Vasco da Gama… were our favorites. Smart Traveler Tip: Lisboa Card will get you free admission to the monastery, but it won’t help you with crazy long lines which can form during peak tourist times, particularly in the summer. Few know that you can get an admission ticket with practically zero waiting time next door, at the Archeology Museum. Yes, I just gave you one of Lisbon’s best tourist secrets, my pleasure! 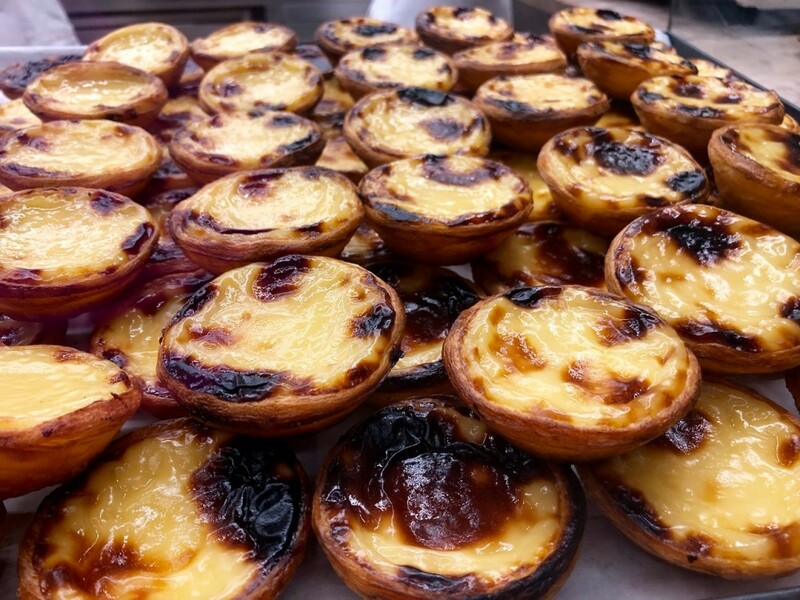 You should be eating pastries everywhere in Lisbon, but while in the Belem neighborhood, make sure to stop at Pastéis de Belém to sample what many consider Lisbon’s most famous pastry: pastel de nata. Best described as buttery custard tarts, they are usually served with a dusting of powder sugar or cinnamon. They are rich and heavenly. The “proper” way to eat them is standing up, with a bica, a shot of espresso. The caffeine and sugar hit combination will make you smile for hours, guaranteed. Doesn’t this picture make you drool? You cannot visit Lisbon without sampling its most famous pastry, pastel de nata. Smart Traveler Tip: Pastéis de Belém is quite famous, so you should be prepared for crowds and long lines. If the notion of this makes you burst out in a cold sweat, I have a great alternative for you: head out to Time Out Market and look for a pastry shop at the south entrance (Avenida 24 de Julho). We found them to be a very close substitute! Don’t even think about visiting Lisbon without reserving at least one night for fado. This unique melancholic musical genre is said to be the window into the soul of the Portuguese people. 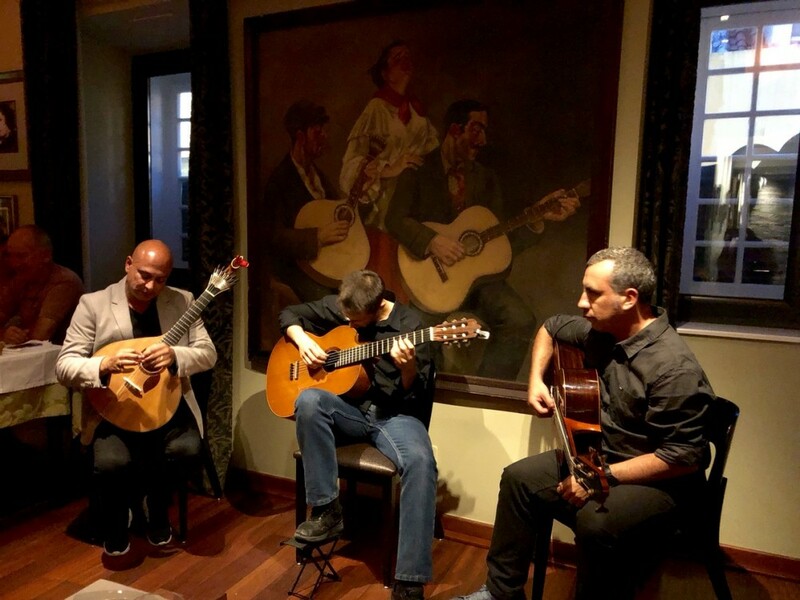 Similar to flamenco in Spain, fado’s exact origins are hard to trace and there are several different theories about its development. Many consider Alfama its birth place, where it was supposedly originally the music of sailors and… ahem… prostitutes. If you want to know more about its history, there is Fado Museum. These days, various fado establishments are scattered all over the city. We visited two of Lisbon’s finest Casa de Fados, fado establishments that offer their guest dinner and show: O Faia and Adega Machado. 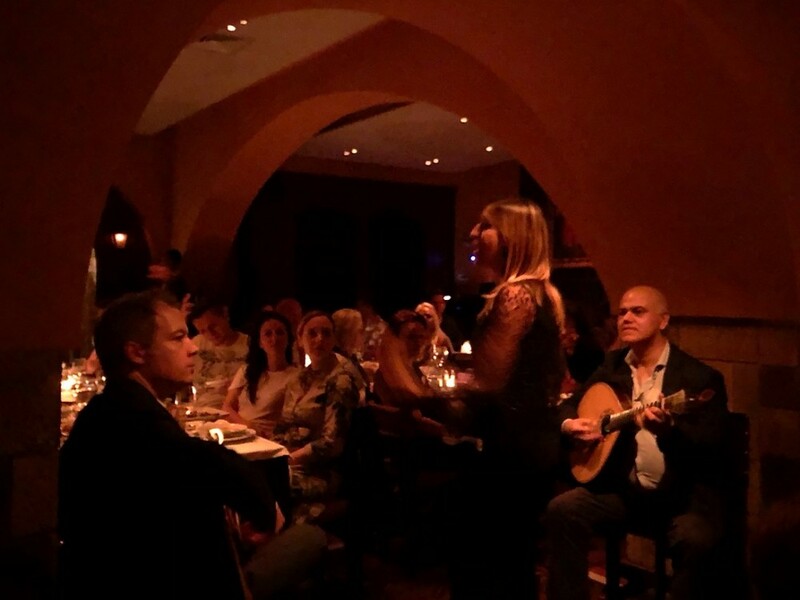 Incredible, soul tingling fado performance and mesmerized audience at O Faia. It was an incredible experience that left our souls tingling with emotion and I wholeheartedly recommend both. I could have seriously gone to see a fado performance each night we were in town if it were not for the late hours, which were tough to keep up given the early start we had every morning (most shows end around midnight or even later). Musicians tuning up their guitars before the show at Adega Machado. I could have gone to a fado house every night of our trip. 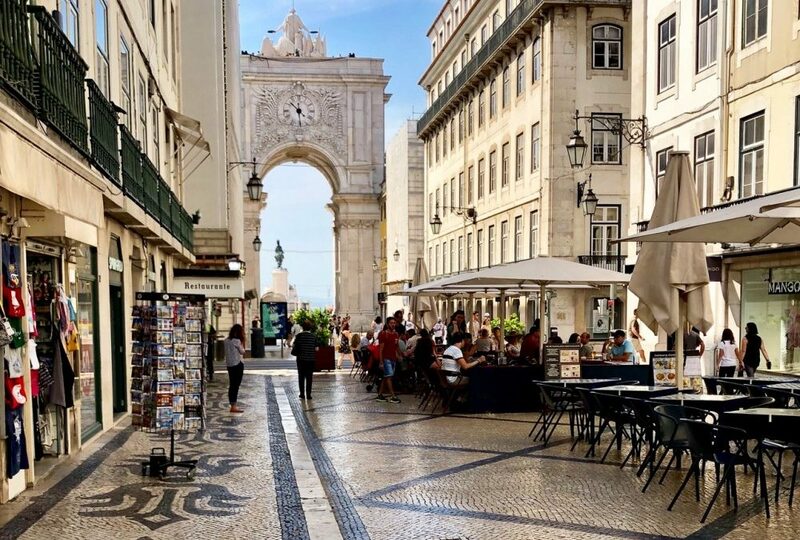 Sure, you can eat your way through Lisbon on your own, but no matter how much research you do before your visit, it won’t be the same as being guided by locals who know the spots that can’t be found on the internet. A friend tipped me off to the food tours organized by Portugal on a Plate and I’m glad we took the advice. 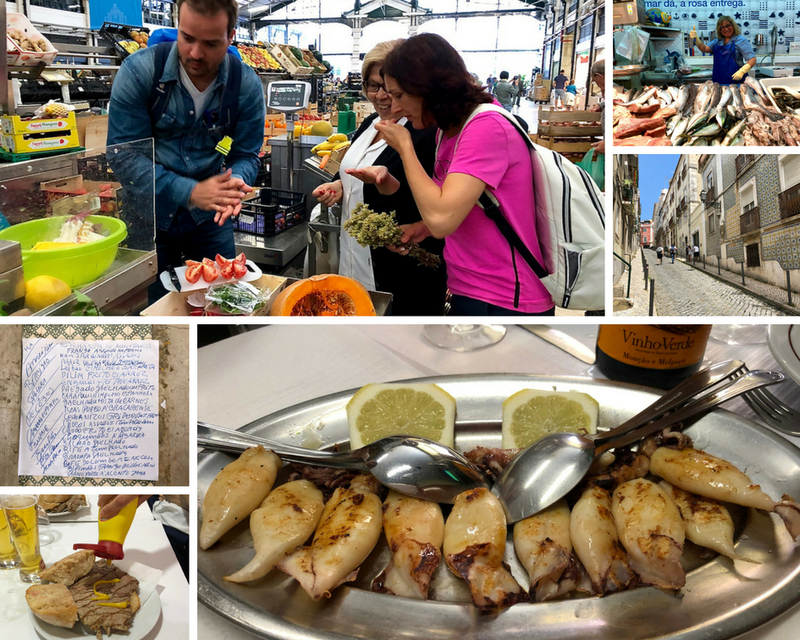 We were lucky to have not one, but two great guides who knew their way around the back streets and many of Lisbon’s local food establishments. Most of our tour took place in the off-the-beaten-track neighborhood of Sāo Bento and Madrigoa at the places frequented by locals. We started late morning with coffee and pastries (we were in Lisbon afterall), then visited fishmongers, cheese and bacalhau (salted cod) sellers and sampled some delicious fresh fruit and vegetables at the farmers market. Then came bolinhos de bacalhau and olive oil tasting, bifanas (Portuguese pork sandwiches) and beer, calamari and vinho verde, sausages, arroz de marisco (seafood rice) and more wine, this time red. Our food tour with Portugal on a Plate was fun, delicious and educational. Highly recommend! By the time our tour was over we were in a food coma and definitely heavier by a few pounds. We also knew a lot more about Portuguese food, wine and culture and made two new friends. 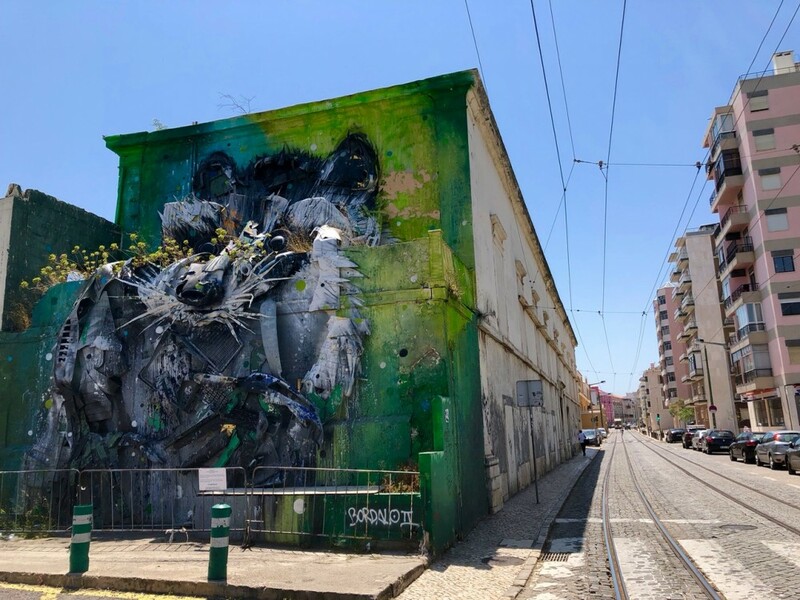 Bordallo II is one of Lisbon’s most famous street artists. His one-of-a-kind work can usually be found on buildings, cleverly constructed from… trash. I first saw a picture of one his unique creations on Instagram. When I read up on him, I became intrigued by his artistic approach “one man’s trash, is another man’s treasure” and I made a note to self to find at least one of his trash animals during our visit. Surprisingly, I had a hard time finding exactly where they were. I asked a few locals, but they either did not know or gave me conflicting directions. However, it looks like it was meant to be! I ended up running into his Racoon and the Fox quite accidentally. The first one by the Belem Cultural Center and the second one just west of the Time Out Market. But there are many more: owl, fish, rabbit, crane, bee, frog, prairie dogs. Looking for them is a unique scavenger hunt with a great artistic (or Instagram) pay off. How cool is this raccoon? Hunting for Bordallo II’s trash animals is one of the cool things you should do in Lisbon. Yes, you can visit all three in one day, comfortably, just like we did, with Lisbon Riders. The company did a fantastic job and we loved our experience! 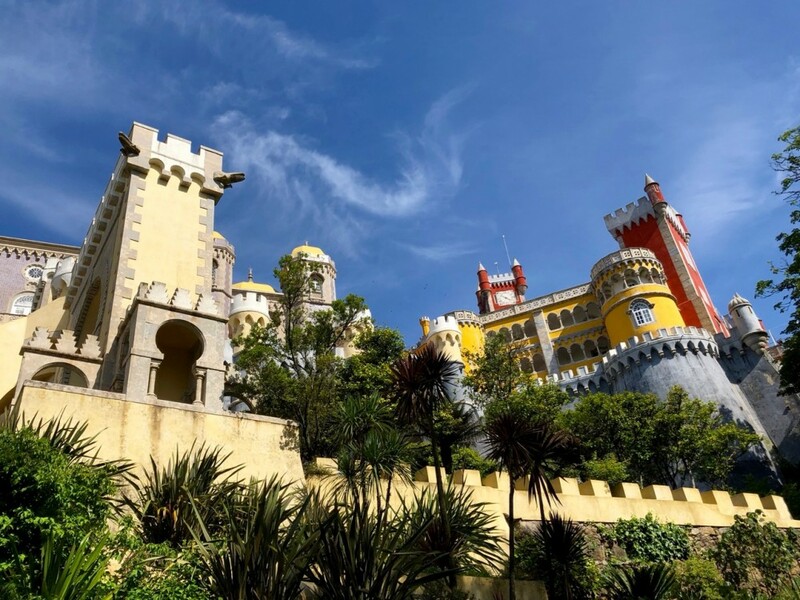 In the morning we toured the spectacular, flamboyant and eclectic Pena Palace with our guide and then strolled around the quaint village of Sintra on our own. After seeing dozens of stunning photos from fellow travel writers, Sintra was a place I have been wanting to see for a long time. Luckily, it is an easy day trip from Lisbon. After a terrific lunch and some of Sintra’s famous pastries, travesseiros and Sintra cheesecake (I told you, those pastries are everywhere), we headed west, towards the Atlantic ocean. We stopped at Azenhas do Mar, one of the most picturesque seaside towns in Portugal. It is famous for its stunning views overlooking the Atlantic Ocean, beautiful beaches and great surfing waves. A short drive away is Cabo da Roca, the most western point of continental Europe, once believed to be the end of the Earth. More stunning views of the Atlantic coast! 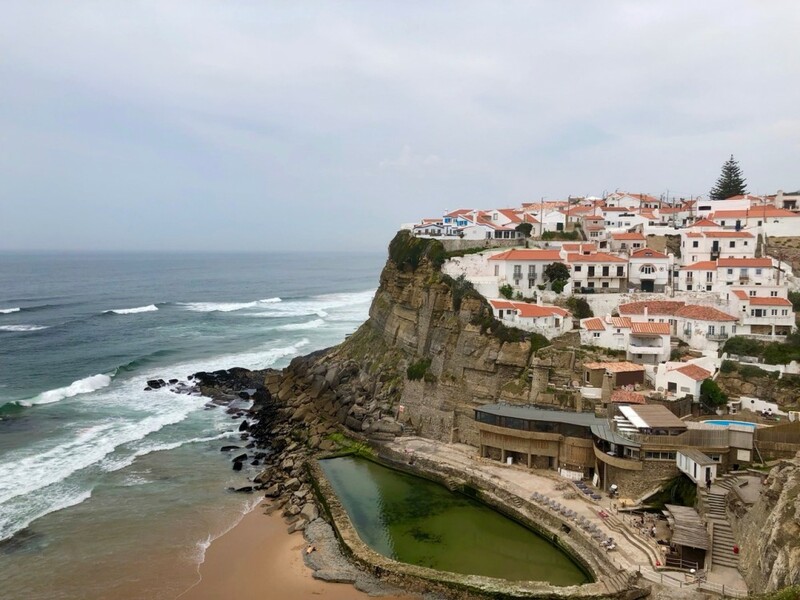 Azenhas do Mar is one of the most picturesque seaside towns in Portugal, famous for its stunning views overlooking the ocean, beautiful beaches and great surfing waves. We ended our day with a stop at Cascais, a former fishing village that gained fame as a resort for the Portuguese royal family. It is a very popular vacation spot, just a short drive from Lisbon. For the grand finale, we got to try the most famous ice cream in Portugal, Santini’s Gelati. I have to say that I have pretty high standards when it comes to gelato, but that ice-cream was incredible and truly, some of the best I’ve ever had. Can’t wait to be back, Lisbon! There certainly seems plenty to do in Lisbon, thanks for all the tips. Even the toilet sounds fascinating! I particularly love the wall art of the racoon – very cool. Thanks for such an informative post, Vera. Thank you for your nice comment. So glad you liked the article. So happy I inspired you. Thank you for reading! Fantastic article Vera!! Made me feel like I just had my own little private tour right here! Awesome!! Thank you so much, so glad you liked it! Lisbon is such a great city to visit, I can’t wait to go back. Glad you enjoyed Lisbon! Lots to see and do in the capital. But I have to mention the big earthquake happened in 1755, not 1855. Thank you for reading and pointing out my typo. You are absolutely right and I fixed it right away!